Will Nico Rosberg win his third Austrian GP in a row? After a dominant performance in Baku, Nico Rosberg completed the second Grand Slam of his career – leading every lap of the race from pole position and scoring the fastest lap of the race. Seemingly content with his achievements he then headed to the Goodwood Festival of Speed to blow off some steam and looked relaxed as he chatted with fans and other drivers. Nico heads to Spielberg this weekend in a good head space and will be confident of increasing his gap over Lewis Hamilton in the drivers’ championship. With five wins already this season, he’ll be tough to beat this weekend and he’s also the only current driver to have won at this track, taking the chequered flag in both 2014 and 2015. Are Williams the main threat to Mercedes this weekend? A mixed start to the season has seen Williams’ form vary from the lows of Monaco (where the team struggled to a tenth place finish) to the highs of Canada (where they were quick all weekend and finished on the podium). Williams’ design philosophy means their car tends to come alive on quicker circuits, yet struggles on the slower circuits. Being one of the quicker circuits on the calendar, Williams unsurprisingly performed well last year with Massa scoring a podium and Bottas finishing fifth. 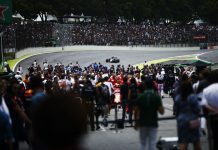 Nico Rosberg said earlier this week that he expects a strong challenge from Williams this weekend, and with the team having fallen to fourth this year, it’s race weekends like this that Williams must take full advantage of. Can Sergio Perez keep up his tremendous recent form? After a slow start to the season, Sergio Perez has been a revelation in recent races and after two stunning podiums in the space of just a few weeks, rumours have gathered pace of a potential switch to Ferrari next season. Force India performed well here last year with both drivers in the points and the team have made real progress since the Barcelona test in May. Can Red Bull return to form at their home race? 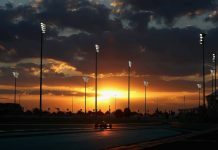 Red Bull had one of their poorest weekends of the season at this race last year, qualifying down in eighth and fourteenth and only managing to score a single point with Ricciardo coming home in tenth. It wasn’t much better back in 2014 when Ricciardo’s eighth place finish was scant reward from a frustrating weekend. Since Max Verstappen’s win at the Spanish Grand Prix, Red Bull’s form has been mixed with neither driver finishing on the podium in the past two races. Are we about to see a new lap record? Michael Schumacher still holds the lap record here from back in 2003, but we could well see that record broken this weekend. The track has recently been resurfaced to remove some bumps, and after a recent DTM race the drivers reported improvements of over two seconds per lap as a result. With Pirelli’s new ultrasoft tyre making an appearance this weekend, the teams are suggesting that the current record of 1m07.908 could be lowered to around the 1m06 mark or possibly even lower.